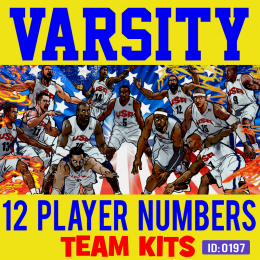 Ideal for Basketball team are these baller Varsity Player Iron-on Numbers. Available in 4, 6, 8, 10, and 12 inch size, in 28 colors. Each Kit con.. 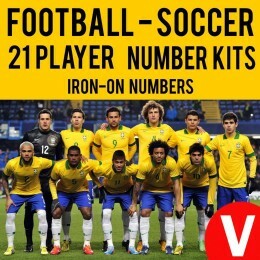 Player Iron-On Numbers come in Sizes 4"- 6" - 8" - 10" - 12" - 15" Tall, in sports Number fonts. Custom made with Flex Transfer materials with large 28+ co.. These are VINYL flex sport Iron-on Numbers. 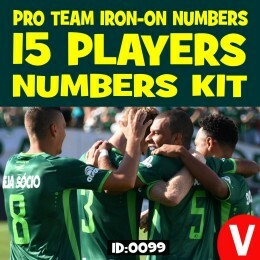 This 15 player iron-on numbers kit comes complete for 15 players, 1 to 15 consecutive, you choose the font, availabl.. 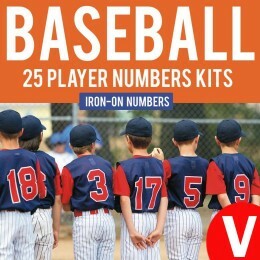 Player Iron-On Numbers come in standard sizes 4"- 6" - 8" Tall, available and in various colors. 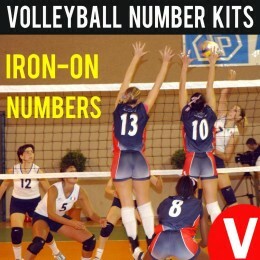 You simply iron them onto your own Volleyball Jerseys. Eac.. Your team name with one of the popular team designs iron-on transfer Team Logos ready to apply on your team player jerseys. To order select design number, ..